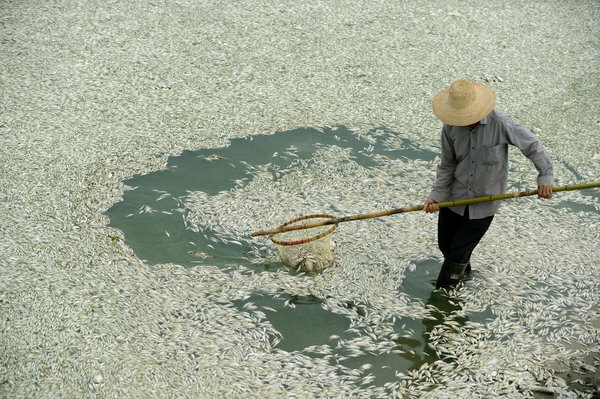 HONG KONG — Thousands of dead fish floating along a 19-mile stretch of a river in Hubei Province in central China were killed by pollutants emitted by a local chemical plant, provincial environmental officials said Wednesday. Environmental protection officials said tests on water taken from the Fu River upstream from the metropolis of Wuhan revealed that extremely high levels of ammonia in the water were caused by pollution from a plant owned by the Hubei Shuanghuan Science and Technology Company. The tests, conducted by environmental officials from Xiaogan City, revealed ammonia concentrations downstream from the plant as high as 196 milligrams per liter. The World Health Organization notes that naturally occurring ammonia appears in surface water at concentrations of about 12 milligrams per liter, while the similar figure for drinking water is around 0.02 milligrams per liter. Shares in Hubei Shuanghuan were suspended from trading on the Shenzhen stock market Wednesday pending the release of an announcement. Calls to the company’s headquarters were not answered on Wednesday. Provincial officials ordered the company’s plant to cease production while the cause of the leak was investigated. The plant produces sodium carbonate, used in making glass, and ammonium chloride for fertilizer, according to local news media reports. It has been cited for environmental violations four times since 2008, said Ma Jun, director of the Institute of Public and Environmental Affairs, a Chinese nongovernmental organization that tracks air and water pollution. “Each time it was ordered to be corrected, but this demonstrates that enforcement is way too weak and the cost of violations way too low,” Mr. Ma said. People living along the river said they first noticed fish dying on Monday morning, and a sickening stench began to fill the air, China National Radio reported. About 110 tons of dead fish have been cleared from the river, the state-run Xinhua News Agency reported Wednesday. Environmental officials said the river was not used as a source of drinking water, and they urged residents not to panic. Spills in China have often set off runs on bottled water because of fears of contaminated supplies. China’s Ministry of Environmental Protection said water pollution was a serious concern, with industrial spills, farm runoff and untreated sewage all factors in degrading water quality. As of last year, nearly a third of the sections of major rivers it monitored were so degraded that the water was unfit for human contact, the ministry said in its annual State of Environmental Quality report, released in June. The Fu River flows into the Yangtze, China’s longest river and the source of drinking water for millions. Spills into the Yangtze and its tributaries remain a continuing problem despite huge investments in reducing pollution, Mr. Ma said. “Even though it has a large volume of water, with 40 percent of China’s wastewater dumped into this watershed we are concerned about the health of this river and the quality of its water,” he said.